Heat oil in a pan and splutter mustard seeds. Add dry red chillies, sliced shallots and chopped green chillies and saute. Then add crushed pepper and saute for a minute. Add cauliflower florets, turmeric powder, grated coconut and salt and mix well. luks yumm. Shabbu. great with rotis and chapathi. 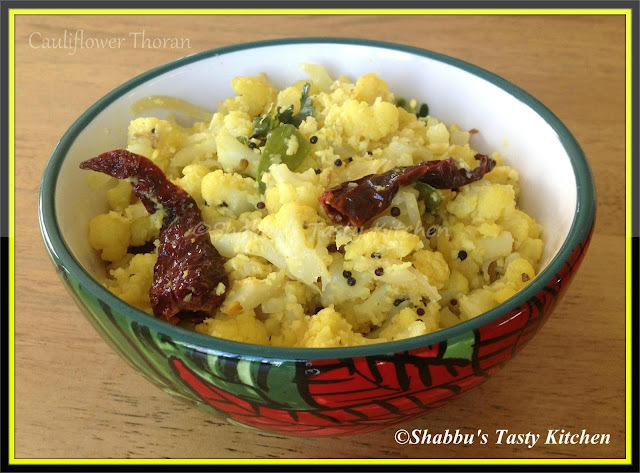 Never heard thoran using cauliflower... Super tempting ! goes good with roti!!! i love it! Yummy and healthy thoran...nice clicks. Never cooked cauliflower in this way! SHall try next time..looks yummy!